This week, the Encinitas City Council heard a fascinating presentation on the history of La Paloma Theatre from architectural historian Samantha Murray of Encinitas’ Dudek consulting firm. We received the report after my request that we look into what the city can do to help preserve the venerable, privately owned La Paloma building. La Paloma Theatre as it is now. In collaboration with the Encinitas 101 MainStreet Association, Dudek donated their services and put together the materials necessary for the property to be deemed eligible for inclusion on the National Register of Historic Places and the California Register of Historical Resources. The theater also now qualifies as an historical resource for the purposes of the California Environmental Quality Act. In the 1880s, only a few dozen people lived in the greater Encinitas area. Growth was slow until the 1920s, when the formation of the San Dieguito Water District provided dependable water from Lake Hodges and allowed the population to expand. The flower industry and avocado crops were introduced in the 1920s, and with development increasing, a Santa Monica bank president, Aubrey Austin, purchased large parcels of land. 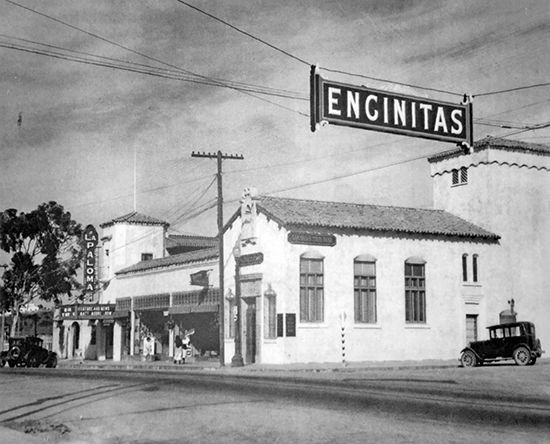 Believing that the rural town of Encinitas could become a major tourist resort, he built La Paloma between 1926-1928. La Paloma Theatre, circa 1928. La Paloma today, 88 years after it opened, still showcases the same unique architectural features, which are the 1920s Spanish Revival-style architecture on the exterior and Moorish/Art Deco style on the interior. When built it seated 300 people and was equipped for live acts, a full orchestra and silent films. It was one of the very first theaters to show “talkies” or movies with sound. It immediately became a local attraction in an area that offered little in the way of nightlife, being the only theater in the San Dieguito area of Del Mar, Solana Beach, Cardiff, Encinitas, Olivenhain and Rancho Santa Fe. It is now one of the last remaining examples of a single-screen theatre in Southern California. La Paloma flourished despite the 1930s depression by offering escapist movies with rags-to-riches themes, and was a popular stopping point along Coast Highway on the journey from Los Angeles to Tijuana during prohibition. But in the post-war 1940s, competition from newly opened theatres in the region took a toll on ticket sales. The theatre stayed in business through the 1950s mainly by offering foreign films. In 1963, it closed its doors for nine years as the popularity of television increased. Ownership continued to change hands and it was rehabilitated in the 1970s, staying alive as one of only two places in the county showing foreign language films. The other theater was La Jolla’s Unicorn Cinema. 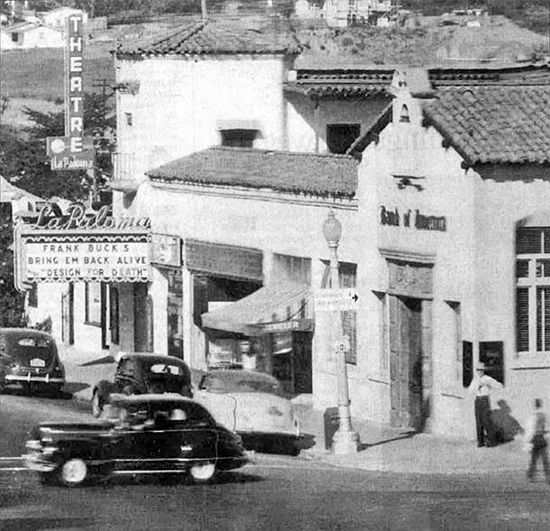 La Paloma Theatre, circa 1940. After its rebirth in 1972, La Paloma became famous for art films, live concerts with many national artists like Jerry Garcia, the Tubes and the Ramones, along with dozens of surf films. Carpeted bench seats and reclining viewing areas on the sides became a counter-culture attraction. The theatre was also used for band rehearsals, lectures, Sunday church and plays. A series of managers showed such things as The Rocky Horror Picture Show every Friday at midnight and featured “Miss Encinitas” contests. In the 1990s and into the 2000s, surf films continued to play an integral part of La Paloma’s appeal. Since 1992, the theatre has been run by Allen Largent and features surf and other action sport films, as well as new releases of commercial movies. It is owned by Lico Realty and Management Company, based in Santa Monica. 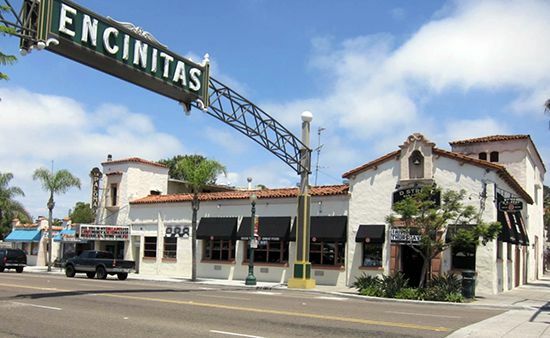 The owner has not been actively involved in the effort to designate the building historic, however, the owner was sent a copy of this week’s agenda item and apparently a recent conversation between the building’s owner and the president of the Encinitas101 board was positive. I recognize that the city’s ability to affect a privately owned piece of property is limited. But my hope is that by continuing to work together with civic groups like Encinitas 101, we’ll identify a path for restoration of the theatre so that it cannot only be preserved, but become revitalized as the crown jewel in our vibrant downtown district. If you’re interested in being a benefactor, or otherwise want to be involved with La Paloma, please reach out to Dave Peck, the President of the Board of Directors of Encinitas 101 MainStreet Assocation at dpeck@coastlawgroup.com or Executive Director Thora Guthrie at tguthrie@encinitas101.com. (Here’s a story about the La Paloma developments from the Encinitas Advocate.) Thank you again to Dudek for the incredible amount of donated work that went into the preparation of the report. We approved $108,000 to help the Encinitas homelessness population, using a “housing navigator.” The proposal is based on a model that identifies “housing first” as the most effective way to help the homeless. Every year, a point-in-time survey counts the number of homeless people by using a large team of volunteers scouring our streets on an early January morning. The 2015 results indicated that we have 123 homeless people in Encinitas, with 80 of them unsheltered. Estimates indicate that 25 percent of unsheltered homeless people are veterans. Our one-year pilot project aims to house 25 of these homeless people, with priority given to sheltering all of the veterans. The money is not used to pay monthly rent, but mainly for the housing navigator, a masters-level social worker, who connects people with the services that already exist. Some of the money is also used as an incentive for landlords, specifically $500 for a landlord who rents to a homeless veteran. The money may be used for security deposits, utility deposits, and transportation costs to help someone get established with housing. If you are a landlord who would like to participate, please reach out to Rebecca Palmer at the Community Resource Center at rpalmer@crcncc.org or call 760-753-1156. Homelessness is a tragedy and an epidemic, and it’s getting worse — not just here, but county and nationwide. Some cities have a much more substantial problem than we do, as can be seen by walking around places like downtown San Diego at night. We all have a responsibility to help other humans in need, and this $107,000 is a commitment well worth making. We approved several items regarding our city government’s communications strategy. One that’s particularly good is allowing members of the public to comment on agenda items without having to attend a city council meeting. This feature will help us gather substantially more input from residents who want to participate. I opposed the proposal to have the city put money toward what was originally a “citizen satisfaction survey,” because I didn’t see that as a good use of $30,000. We’re already doing four other surveys, including one related to how satisfied residents are with our public parks, beaches and open space. My colleague, Deputy Mayor Shaffer, suggested postponing the survey until after the election so it won’t become political fodder funded by public tax dollars, and that instead of surveying “satisfaction” we survey “civic awareness and engagement.” While this suggestion was an improvement, for me, the idea behind the survey remained too broad and ill-defined, so I voted against it in what was a 4-1 vote. It’s important that as we move forward with the Coastal Rail Trail along Highway 101 and other projects in the rail corridor we consider the input of regular citizens who drive, walk and bike our streets. Locals are more likely to have well-informed ideas about placement, curb cuts, alignment, colors, crossing spots, widths, etc. than out-of-town planners. I’m very grateful that the mayor was willing to move forward with a Rail Trail Working Group, which will be appointed by the mayor, hopefully with input from the City Council. Appointments involve difficult choices and a working group adds a level of oversight and hassle to projects that some may think is unnecessary. I’ve heard it said that we hire professional staff to figure out these details. In my mind, professional staff are indispensable, but there’s nothing like homegrown input to ensure that we get the best project. The application for the Rail Trail Working Group is now available here, and the deadline to apply is May 19, 2016. I’m hoping we’ll have applicants who’ll bring a wide range of expertise and perspective to the group. There’s no City Council meeting next week, so you’ll next hear from me on May 15. In the meantime, have a happy Mother’s Day! 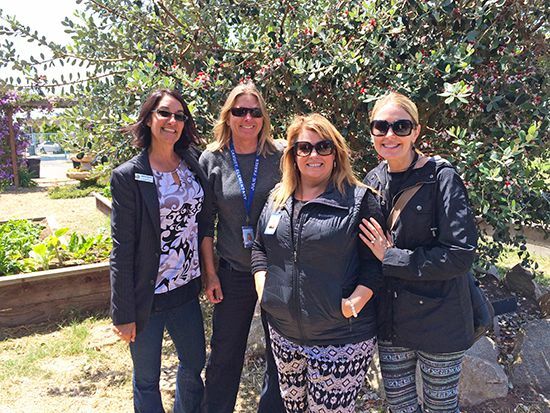 This week, I was lucky enough to join the principals of both Cardiff Schools and the Cardiff superintendent for a tour of the thriving school gardens at Ocean Knoll elementary school led by Mim Michelove, the Director of Farm Lab at the San Dieguito Union School District. Pictured from left to right are Mim Michelove, Cardiff School Principal Julie Parker, Ada Harris Principal Janelle Scheftner and Cardiff School Superintendent Jill Vinson. Previous Post4/24/16: Inside two appeals, water rates going down(! ), and more…Next Post5/15/16: Council Passes Urban Agriculture Ordinance!